Like many in town, our home has not been immune to an influx of sugar ants in recent weeks, made worse by a wet May. Unfortunately, word spread among them that, due to its plentiful supply of improperly disposed lollipop and Popsicle sticks, my 5-year-old son Ray’s bedroom was a sort of ant Las Vegas. At bedtime for a week straight, no matter what we did to make his room less interesting, a steady line marched past his bed, the sight of which, combined with a tired brain and body, resulted in as many tears as ants. It’s for times like these I keep books of ancient wisdom lying around, not only to squash pests, but also for random perusal while gnashing my teeth in the midst of a family crisis. On any given day, at least one parenting book from the library gathers dust on my nightstand, but who actually has time to read those? I’m a big fan of the idea that a quick fix may come neatly packaged in a mystical phrase composed thousands of years ago. After all, ancient Sumerians must have had quite a few household bugs. I was getting zilch from the Epic of "Gilgamesh," however. “Let all the wild beasts, the hyena, the panther, the cheetah, the stag, the jackal, the lion, the wild bull, the deer, and ibex, lament thee!” Huh? What about ants? Sun Tzu’s "The Art of War," which seems to beg for a modern application to parenting, wasn’t much help, either. “Appear weak when you are strong.” I’ve got that one down. How about the Good Book? “Abraham was the great father of a multitude of nations, and no one has been found like him in glory.” Thanks for setting the bar so high, Abe. As a parenting strategy, this grabbing for stray bits of wisdom from ancient texts has never actually worked for me, or anyone else foolish enough to try it. But a solution to my nightly ant-related meltdowns did finally come from a book, although it wasn’t translated from a language that’s been spoken in the past millennium. It was just a picture book about monkeys, Esphyr Slobodkina’s "Caps for Sale," which I had been “steamreading” (the time honored tactic of simply continuing to read, steamroller-style, in the face of whatever bedtime drama is generated by the child next to you, who may be singing a song, jumping up and down, asking you to read a different book, or crying about ants colonizing his room). First published in 1938, it’s a classic, if not ancient story about a hat peddler who falls asleep against a tree one day and wakes to find his wares stolen by a gang of miscreant monkeys. When he demands the return of his caps, they imitate his every gesture from the safety of the branches above, until, in a final burst of rage, the peddler throws his own hat on the ground. Unable to stop themselves, the monkeys throw theirs down, as well. Problem solved! Suddenly I wondered if, like the peddler’s monkeys, our ants might provide their own solution. I almost stumbled upon this idea during failed attempts to console Ray, when I reminded him how much he had enjoyed the ant farm he received for his birthday a few years back. Those mail-ordered unfortunates had long since marched off to the great Anthill in the Sky, but we had their old digs stashed somewhere. Why not bait the empty ant farm with a lollipop stick, place it in the middle of the trail, and capture a bunch of ants for a brand new colony? 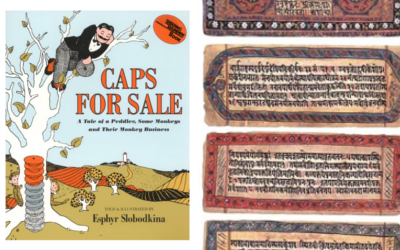 Caps for Sale is no holy writ, but it seemed to have worked a miracle. Ray’s tears stopped. Alas, so had the rains. The next day he dutifully ate his Dum Dum, but when we went to set the trap, not an ant remained in the room, just a lot more tears, and screams even louder than before. Anyone seen my Bhagavad Gita? — Dan Coleman is a Collection Development Librarian at Lawrence Public Library.